The Social Care Commitment is a sector led initiative that focuses on improving workforce quality, instilling shared values, and driving the highest standards of professional, compassionate behaviour across adult social care. One of the major benefits of signing up to the Social Care Commitment is that it can be used as a tool to support the achievement of other key initiatives and standards throughout adult social care. 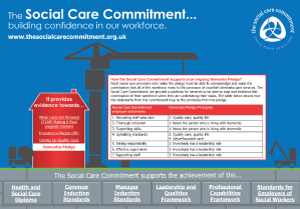 To help employers understand how the Social Care Commitment can be used this way, Skills for Care has produced an interactive graphic, which illustrates how the Social Care Commitment fits within social care. 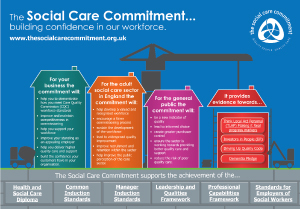 The graphic explains how the commitment can benefit your business, the wider social care sector and the general public; as well as showing that it can be used to provide evidence to help you with the Driving up Quality Code.